Decorative aquarium in the house is not only stylish and fashionable element of the interior, but is also a source of positive emotions and relaxation. It's so nice relaxing contemplation of the water and the underwater world. 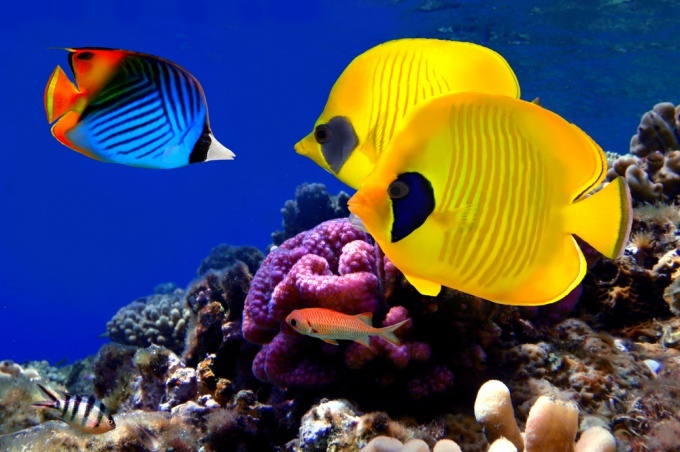 It is therefore very important to correctly make and place your aquarium. - decorations: toys, towers, shells and so on. Select the correct location of the aquarium. This must be the place in the room that is not illuminated by direct sunlight. 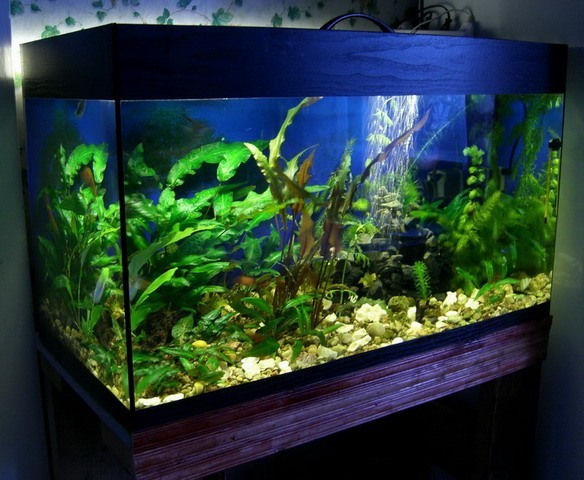 In bright light very quickly grow algae. Select a place where you may wish to sit and admire the underwater world created by your hands. Buy in pet-shop special primer. Its role is largely decorative. 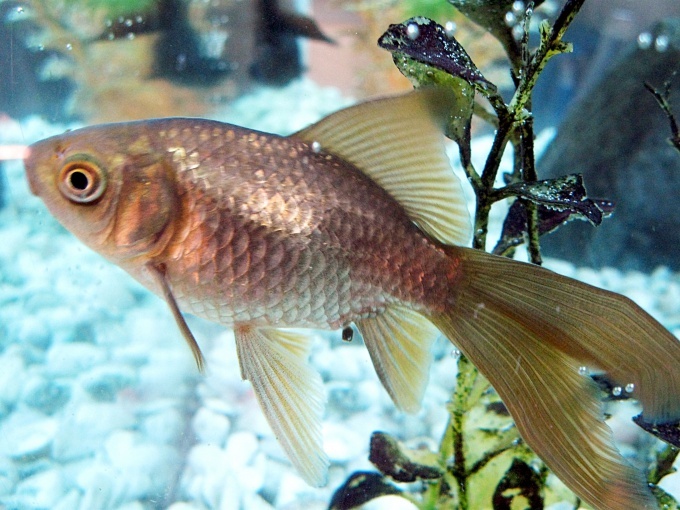 Before you put it in the aquarium, and rinse thoroughly under running water. Also bring home some of the soil taken from a clean river or Creek. Natural soil is simply necessary to the life of algae and other underwater plants, as power of their root system. This soil not only wash, but also boil. Prepared natural ground pour on the bottom of the aquarium. Add on top of the purchase soil, spreading it in a thin layer. Thereby you will arrange and decorate the bottom of the aquarium. Now, make stones and wooden snags. The stones boil. And driftwood that will also serve as a decoration for your aquariumand due to its whimsical form, just pour over boiling water. If you wish, you can purchase plastic driftwood, decorated wood. Place the stones and driftwood in the aquariume on top of the soil. Spread aquariume those underwater toy that is to your liking. It can be towers, castles, Grotte. Or create the illusion of a sunken pirate ship with jewels. To do this, we loaded the boat with a string of faux pearls. 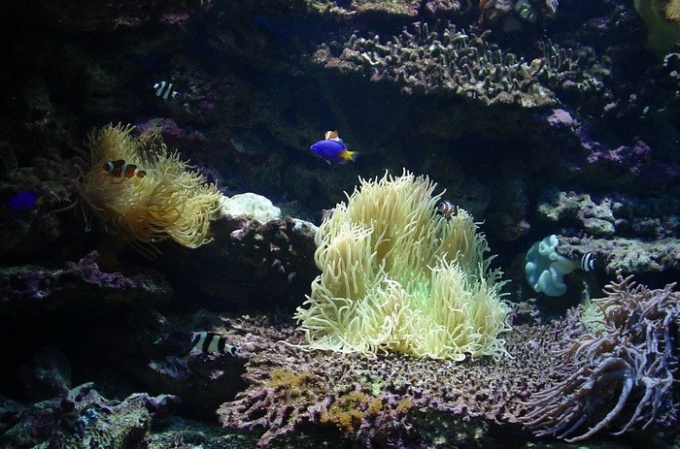 Fill the aquarium with cold water using the hose. Try not to erode the soil. Use the shower head. 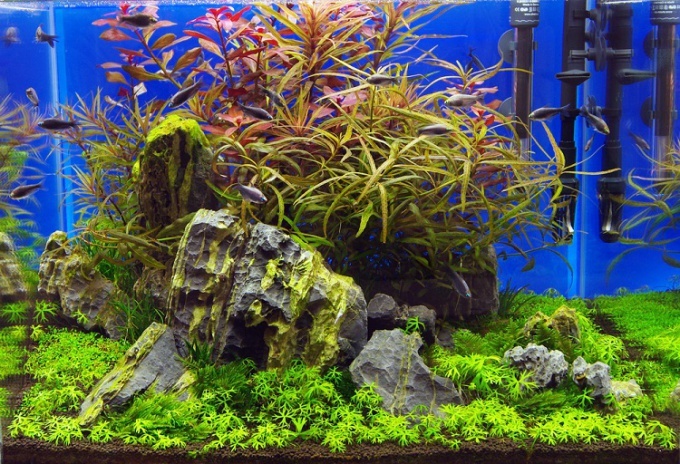 Now you can start to design the aquariumand plants. Low-growing plants planted to the front wall, high - in the background. Can make a frame from algae for some underwater toys. So after all the efforts of the water in the aquarium is not dimmed, check in the beginning, did you have washed the ground. This large glass jar, fill a quarter with pure water and add two handfuls of soil, and watch. If the water in the Bank was muddy, then the soil must be washed again. Do not be lazy again to check. Otherwise all the work on the design of the aquarium will be in vain, and you will have all the work done again. Aquarium filled with plants, good lighting pendant lamp. 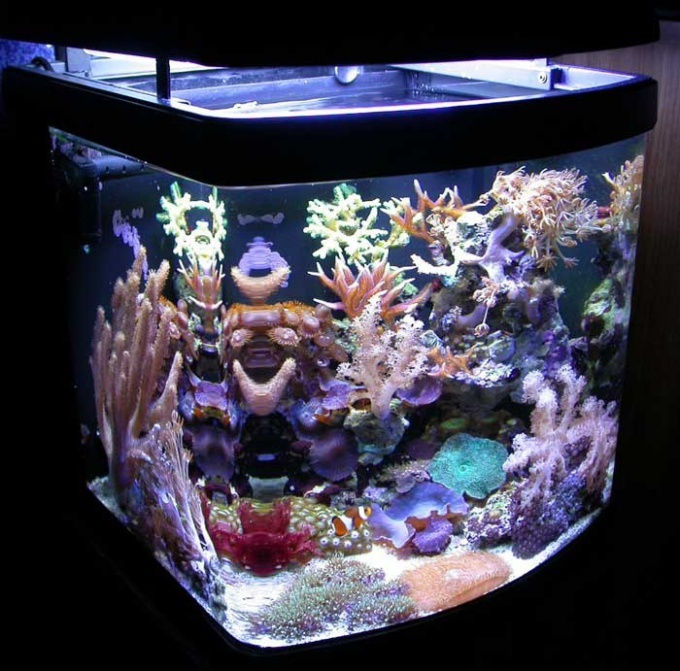 This ensures that all elements of the underwater world are clearly seen, and the aquarium will look elegant element of your interior. And your room will be filled with warm light.